1. 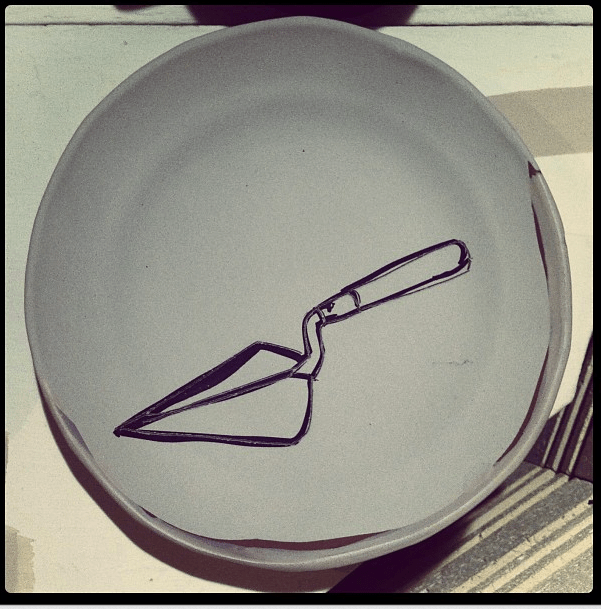 Where and when were you first introduced to clay? I was a sophomore at Alfred University and had signed up for an intro throwing class for the hell of it. It was the spring semester of 1999. 2. I have read about the influence of an introductory throwing class with Linda Sikora on the intellectual approach to your studio practice. Was this class also a pivotal moment if your choice to pursue ceramics? Yes. But prior to that class I had had a semester of printmaking. I latched on quickly to the process and the chance to work through visual ideas in a way that was more layered than painting or drawing. I had taken a lot in from books, looking at the work of artists like Jim Dine, Richard Diebenkorn, Robert Motherwell, and Larry Rivers, among many, many others. I think that I was attracted to the physical aspect of their work, which although they were working on a flat plane the images looked as if you could grab them with your hands and hold on. I was already primed to work with my hands, and Linda’s ability to articulate abstract ideas pushed me over the edge. It seemed that someone who was smart, interested in both abstract ideas and notions of beauty and also wanted to work and think technically would make pots. I also just really liked working with clay. And it was difficult to throw pots (and often still is) and I liked that challenge too. 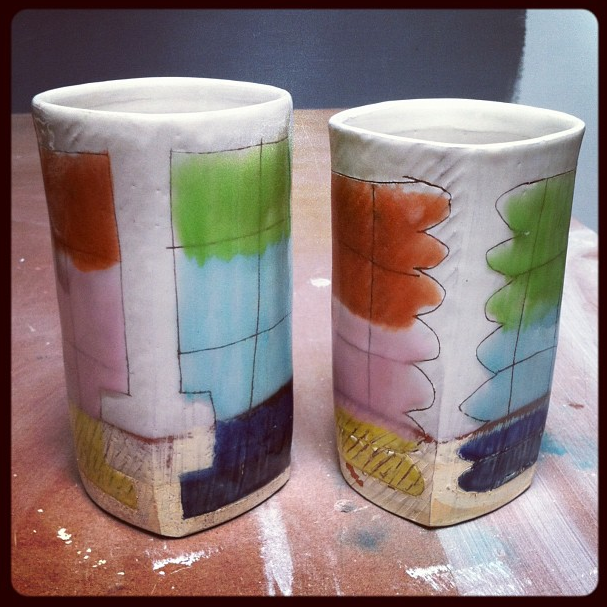 Tumblers, earthenware, slip, glaze, 3 x 3 x 6. 3. 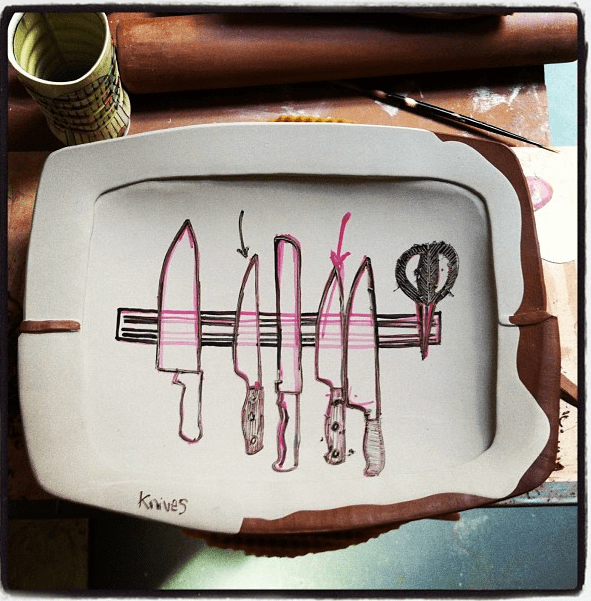 Have you always maintained both a drawing and ceramics practice? More or less. Sometimes I catch myself telling others about my drawing practice, but the truth is probably that I think more about drawing than actually doing it. I think about the process that I go through, its comfortable nature, and how I can manage to bring that sense when I’m making things out of clay. I have gotten attached to a more intellectual idea of what drawing is. It has served me well, but I am headed back toward just putting pictures on paper naturally. It takes some effort for me to not just go into the studio and work in clay and instead to pull out some paper and gouache and sit at the kitchen table for a few hours of quiet work. 4. How do the mediums of drawing and ceramics interact and influence one another? They both have a very immediate sensibility in the way that I use them. Pencils and clay will do anything you want them to. They respond immediately to the action of the user, and people know this. I recently remembered how comfortable drawing is, that I don’t take it too seriously and I don’t judge myself as harshly because of it (which is what happens constantly when I’m working in clay). It comes from a place where I’m able to trust myself. I’d like to keep that thought in mind when I work in clay. 5. From your interest in European peasant pottery you strive for honesty in your work. How do you think honesty is expressed in a pot? It depends. When I think about looking at other pots I usually know it when I see it. It’s a case-by-case scenario. One would have to take into account the context in which the work was made, right? Those old peasant pots aren’t anything more than what they are, and they glow because of it. I think when I see that kind of honesty in a pot what I’m seeing is the maker coming through, or that the maker is completely connected to their work. 6. You have encouraged our generation of studio potters to share the narrative surrounding our work as a means of building and connecting to an audience. What is the narrative surrounding your work? I might say that the narrative surrounding my work is one of searching, finding what works, and moving through ideas…maybe trying to get to the truest version of my work. Right now my work is in flux and in the early stages of changing. It’s too soon to say exactly what the narrative around my work is (someone else might have a more objective opinion of it than myself), but I would like to move from a more self-concerned vision of how drawings and pots work together to one that has more to do with the pot as a functional object in the larger world. Platter in progress, earthenware, slip, ink and underglaze. 7. Is the Jonescast part of your way of sharing this narrative? Sure. One of the reasons that I started the program was essentially to reach to the outside, invisible world of other people’s ears and hope that someone would understand. I wanted to know if anyone else was going through the same things I was. I share, sometimes over share, what’s going on in my head or in my studio. The audio format is more intimate and easier for me to handle than a blog post. The level of connection is deeper, and my decision to not edit gets me toward a place where I’d like my work to go: an informative, casual, intelligent, sometimes charming engagement. 8. What have you learned from doing the Jonescast? Has the experience surprised you in any way? I’ve learned to keep my attention and focus on the person at hand. I sometimes listen to old programs and hear myself asking a question in order to set myself up to get a chance to say something. I work at keeping that at bay and just try to ask a better question of my guest than the one before it. I’ve also had to rethink how I want to present myself, how I want to word certain things, and to prep for a guest in a way that gives me flexibility in conversation. I’m surprised that it’s become such a part of my studio practice, if anything. 9. How has becoming a father changed or influenced your work? I don’t get much time in the studio for the time being because I’m a stay at home dad. When I do get in there I try and be as efficient as possible, but it does take me a lot more time to work through ideas or maintain momentum. As much struggle as one goes through in the studio I don’t really have time for self-pity. I welcome change and know that I will get through it, although the when and how that will happen is up in the air. I am trying to focus on the process of making (and being a good father) rather than the outcome (like getting my daughter to stop chucking food off of the table and letting her work it out on her own.). 10. How do you balance the demands of being a husband and father as well as maintaining a studio practice, business and podcast? I’m not really sure. Sometimes it seems like I’m on top of things, and then all of a sudden I’m not. I work from lists, organizing my week on Sunday nights. That works for me the best. Lots gets lost in the cracks and I’ve had to lower my expectations in terms of what I can actually get done in a day, home or studio. I will say that I am very lucky in that my work is not supporting my family and I don’t have to be in the studio. I can tell myself that I have time to make changes as I see fit. As much as I want to be successful as a businessman I see the value in having the opportunity to be home with my daughter and letting business slide for a bit. 11. Have you begun to answer the question you posed at NCECA: How will I be able to make a living now and into the future? I’m looking at what options I have when I think about working in different ways. I’m beginning to look at how pots look to people who don’t have a degree in them and see what they see. I’m trying to be more open. I’m thinking of working with slip cast pots and forms and using different clay, which is something I wouldn’t have done in the past. 12. How do you stay inspired when you are not inspired? What helps you continue going into the studio? I can always go to the studio, seriously. And on the off chance that I’m not feeling it, I just stay there and wait it out or go for a bike ride and clear my head. The studio is my one place that is my own. No one else really goes down there, and sometimes it’s more of an oasis than a place to get work made. I have a large inventory to work from: books, ideas, drawings from the past several years. I also work in a few different ways so sometimes I just do something else for a while and then go back to the thing that wasn’t working out. 13. You are currently developing new work. How does this process happen for you? I don’t really know. I feel like I’ve spent the past few years working in a way that might be coming from a place I don’t want to work from. This change is happening slowly, for one thing. And I’m very suspicious of my motivations and working through those feelings. I’m trying to make work that doesn’t feel like something’s missing from it, to make work that comes from an honest place and to get comfortable working that way. Everything’s up in the air, and I’ve made an index of my strengths to help guide me through the muck and mire of over thinking. Sandwich plate in progress, earthenware, slip, underglaze. 8″ diameter. 14. How do you recognize when your work needs to change? Galleries send the work back…80% of the galleries at this point. Having that happen has made me wonder why, and to try and see what others are seeing…or aren’t seeing. I don’t take it personally anymore. I simply want to know what’s missing from the work. And then I get a chance to let myself off the hook, no one’s expecting new work from me or I’m not as established as other makers so I can do whatever I please for the moment until something sticks. But I still need to keep in mind where I might be weak and work harder at correcting those problems. 15. Where can your work be seen? What do you have upcoming? The Clay Studio in Philadelphia, I’ll have new work at Charlie Cummings Gallery for the holidays. I’m in a cup show at Crimson Laurel Gallery in Bakersville, NC that runs from Nov 1 – Dec 31. 16. In your earlier podcasts your cynicism about the place of contemporary pottery in the current economy is really evident. More recently you seem to be investigating possible solutions, many of which you shared during the lecture you presented at NCECA, such as your involvement in Objective Clay (objectiveclay.com -where the lecture from NCECA can also be found). What do you think helped you move from a place of cynicism to one of engagement? It is exhausting to always be down, for myself and for others around me. It also doesn’t come off well when trying to sell work. People can sense when someone’s not in a good mood, desperate, or a mix of the two. I also need to be a good example for my daughter. And I believe that things will work out. Cream rises. It’s been proven to me over and over as long as I keep plugging along good things will happen. As long as I keep an open mind and work to the best of my abilities I’ll keep getting a leg up. I didn’t believe that before. I was so focused on the outcome of the show/sale/whatever that I couldn’t see where I was at the time. This is still a struggle for me, but then I snap myself out of it. I also want to figure out how to have a future as a maker, rather than just show up and hope for the best. How fresh and new, yet familiar Brian’s work looks. Congratulations!